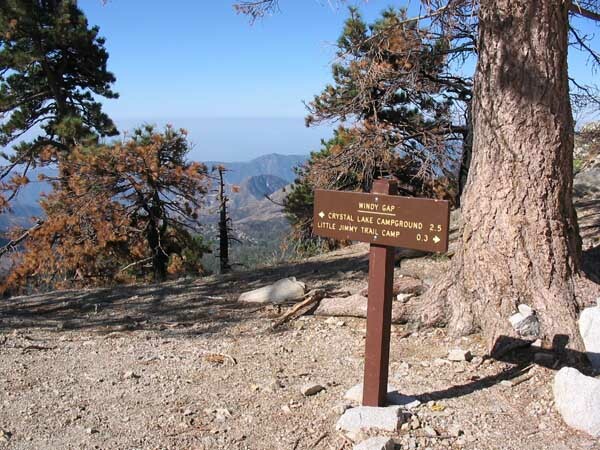 Being one the oldest footpaths in the San Gabriels Mountains, Windy Gap Trail has served for decades as a prime route from Crystal Lake Recreation Area to the high country beyond. The Crystal Lake basin is flanked on three sides by towering mountains forming a giant horseshoeIslip Ridge to the west, Hawkins Ridge to the east, and to the north, the divide that separates the watersheds flowing into the Mojave Desert to the north and the Los Angeles basin to the south. Windy Gap Trail gains 1758 feet as it climbs steadily, offering breathtaking views all along the way. In times past, the hiker traveled under a shaded canopy of mature pine, cedar, fir, and oak. But all that changed on Labor Day weekend, Sunday, September 1, 2002. Some cultists were practicing a pagan ritual when their fire got away and set the forest ablaze. Hot temperatures, low humidity, dry vegetation, and gusty winds created ideal conditions for a horrific inferno. 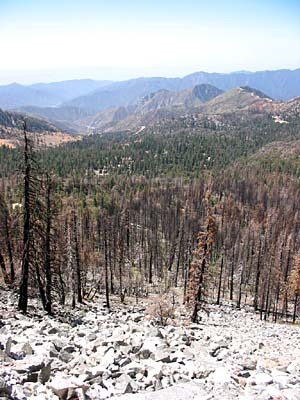 Before the so-called Curve Fire was extinguished three weeks later, the blaze devastated nearly 21,000 acres of our beloved forest. Most of the trees and vegetation on the mountain slopes surrounding the Crystal Lake basin were incinerated, leaving a moonscape with charred sticks. Windy Gap makes a fine destination for this five-mile out-and-back hike. But if you are up for more, there are several other options you can add to your Windy Gap experience, such as continuing another 1.2 miles to conquer 8250-foot Mount Islip. See below for details and links for various options. 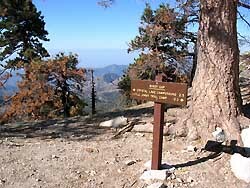 The San Gabriel Mountains high country offers some wonderful hiking weather in the non-winter months. In the wintertime, snow can blanket the Crystal Lake basin and surrounding mountains. Weather in the summer can be perfect for a great hike, but check the weather reports for possible thunderstorms. The Southern California "June Gloom" (thick marine layer, fog) can also reach the high country in late spring and early summer. See Seasons of the San Gabriels for a detailed description of minding the seasons. From Interstate 210 in Azusa, take Azusa Avenue (Hwy 39) north through Azusa and into the San Gabriel Canyon. At about 3 miles from the freeway you'll pass the Forest Service Gateway Center (1960 North San Gabriel Canyon Road (Hwy 39), Azusa, CA 91702.) on your right. Note your odometer. Continue up Hwy 39 for 21 miles to the signed entrance to the Crystal Lake Recreation Area. Turn right drive 2 miles to the visitor center and snack shop. Continue (staying left of the visitor center) and in another half mile you will reach a junction where the road heads in five directions with a locked gate straight in front of you. Park in the large lot on the right. The marked trailhead for Windy Gap Trail is on your left (north) across from the parking area. A National Forest Adventure Pass is required for parking. Looking southwest from Windy Gap. With most of the forest burned away, your views of the Crystal Lake basin and surroundings high country are breathtaking. As you climb higher and higher you'll appreciate the patches of trees here and there which were spared from the fire. Shortly past the 2-mile post, two switchbacks keep the trail at decent grade for the final pitch. After 2.5 miles from the trailhead you reach Windy Gap (7588') saddle and the Pacific Crest Trail (PCT). From Windy Gap you have several options (view Windy Gap photo with trail labels). You can return the way you came for a nice 5-mile round trip hike. Straight ahead (north) takes you to Little Jimmy Spring (few minutes) and Little Jimmy trail camp (0.3 mile). To the right (east) you can climb the Pacific Crest Trail to Hawkins Ridge Trail junction (8390', 1.4 miles) and Mount Hawkins (8850', 0.8 mile from the junction, 2.2 miles from Windy Gap). To the left (west) you can climb Mount Islip (8250', 1.2 miles) (see my Mt. Islip trail description). From Mount Islip, an alternate route would be to follow Islip Ridge Trail all the way to the Crystal Lake parking lot (5575', 4.8 miles), then follow the road back to your car. Another alternate route would be to take Big Cienega Trail. To do this, from Mt. Islip, follow Islip Ridge Trail down 0.9 mile to the marked trail junction, go left (east) and hike Big Cienega Trail 1.8 miles to Windy Gap Trail (see my Big Cienega Trail description). 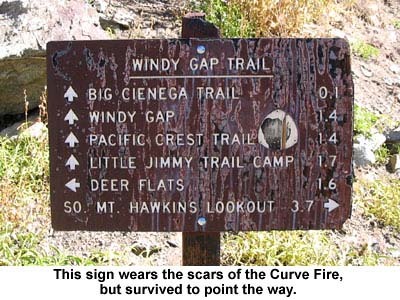 Also note that the Pacific Crest Trail runs through Windy Gap. So if you are up to a long hike, turn left to hike to Canada and turn right to hike to Mexico. In our lifetime, the surrounding high country above the Crystal Lake basin will never be the same as it was before the fire, however, the trails still offer the hiker great rewards. 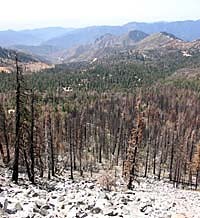 Trail Conditions - Since the 2002 Curve Fire, dead trees continue to fall across the trail. 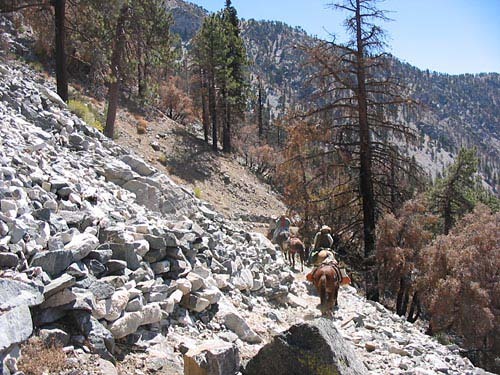 The Forest Service and San Gabriel Mountains Trailbuilders work hard to remove the deadfalls, but more continue to fall and will for years to come. So be aware that unless you hike immediately following a trail restoration effort, you will likely need to climb over or around fallen trees. Also note that there is still some instability on the barren slopes, so expect some debris on the trail, particularly on the scree slopes. If you contact the Forest Service about trail conditions, be aware that they tend to greatly exaggerate and describe a trail in far worse condition than it is. 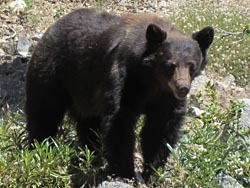 Bears - The San Gabriel Mountains are home to bears, and they are known to be sighted in the Crystal Lake basin. Generally the bears are not aggressive and will avoid humans. If you encounter one, leave it alone and give it space to meander on. Never feed bears or any wild animals. If you are camping, either in a campground like Crystal Lake, or in a trail camp like Little Jimmy, follow the recommended practices for storing your food. Rattlesnakes - A lot of people think that rattlesnakes are found only in the lower elevations. However, rattlers live up here too, as in most parts of the San Gabriels. Exercise good judgment. Access Note 3-22-06: The Crystal Lake recreation area has been closed since the Curve Fire September 2002. 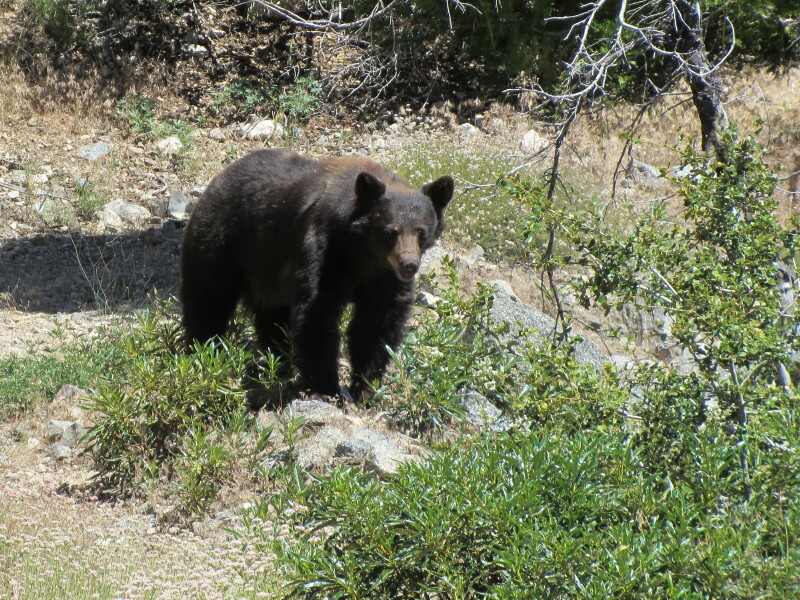 The Forest Service had been repairing it from fire and bark beetle damage, and when I first posted this trip report in August 2003, Hwy 39 to the Crystal Lake entrance was open. But the torrential rains of January 2005 badly damaged the road. So CalTrans has closed Hwy 39 at the gate just above the West Fork, making the Crystal Lake Recreation Area inaccessible to the public. They have made substantial progress, but as of 3-22-06, the Forest Service says that it probably won't be until late fall 2006 before it is open. If you'd like to access these trails before then, come work with the San Gabriel Mountains Trailbuilders. 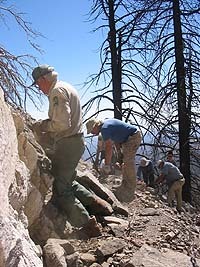 Trail Conditions - Update 11-20-04: The early-season storms of October 2004 inflicted heavy damage to Windy Gap Trail. On October 2, the San Gabriel Mountains Trailbuilders had completed a productive season of work, restoring the trail to good condition. But two weeks later heavy rains gorged large gullies across the trail. There were half dozen washouts that ranged from five to eight feet deep, some up to fifteen feet wide. On November 20, the Trailbuilders, accompanied by an equestrian crew, went up the trial to recover some heavy equipment that had been cached. It was amazing to see these pack animalshorses and mulesnegotiate the deep gullies. The animals and their handlers performed superbly. Access Update 11-20-04: Evidently the Forest Service has again closed Hwy 39 at the gate just above the West Fork, making the Crystal Lake recreation area inaccessible to the public. On a positive note, there is lots of activity in getting the recreation area back to usable conditionutility crews running power lines, workers restoring campground buildings, loggers removing dead trees, and crews dredging the lake. So perhaps Crystal Lake may be open this coming summer. We'll see. Hundred Peaks Section, Angeles Chapter, Sierra Club "Mount Islip" - Driving directions and brief route description (one sentence) - Route 3. Crystal Lake Camp Grounds - Unofficial site by Fred Rice providing a ton of information about Crystal Lake, updated regularly, including extensive photos and description of various trail maintenance projects. 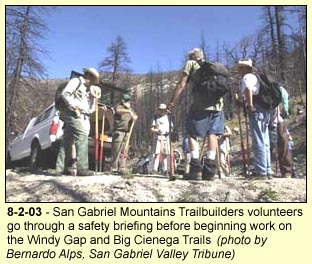 San Gabriel Mountains Trailbuilders - They are the builders of several main trails in the Crystal Lake basin and the primary caretakers of the trail systems in that area. Their website contains some helpful information and photos. Trails of the Angeles: 100 Hikes in the San Gabriels - by John Robinson with Doug Christiansen (Wilderness Press: Birmingham, 9th edition 2013). Hikes 76, "Crystal Lake to Little Jimmy Spring, Mt. Islip." Good trail description and historical background. They incorrectly place the Windy Gap Trail mileage at 2.0 rather than 2.5. 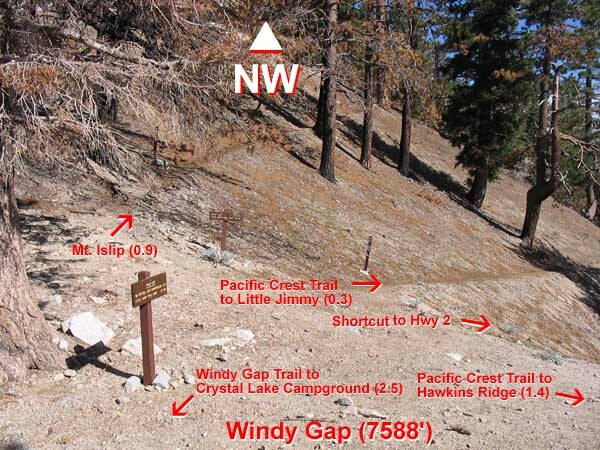 They have corrected the problems with describing the junction at Windy Gap in previous editions. Afoot and Afield in Los Angeles County - by Jerry Schad (Wilderness Press: Berkley, 1990). Area A-9, Trip 4: "Mount IslipSouth Approach." Good background and trail descriptions. Note, his description from Windy Gap is inaccurate and confusing (as was Robinson's before his 9th Edition above). 101 Hikes In Southern California - by Jerry Schad (Wilderness Press: Birmingham, 2013, 3rd Edition). Hike 29: "Mount Islip." Good background and trail descriptions from the alternate routes above. Note, his description from Windy Gap to Mt. Islip is inaccurate and confusing (as was Robinson's before the 9th Edition above). This is the same trial description as in Afoot and Afield, but he adds description for the new Islip Ridge and Big Cienega trails, making the trip a loop. Los Angeles County: A Day Hiker's Guide - by John McKinney (The Trailmaster, Inc: Santa Barbara, 2006). "Islip Ridge: Islip Ridge Trail." Brief trail description for an out-and-back hike ascending Mt. Islip using Windy Gap Trail to Big Cienega Trail, and Islip Ridge Trail. The hike corresponds to half of the loop hike I have described in South Route 2 above. He puts the mileage at 7.25 miles round trip with 2,200 foot gain. His description of transitioning to Big Cienega Trail from Windy Gap Trail is in error. Also, even though the book was published in 2006, four years after the Curve Fire, he makes no mention of the fire and describes ascending "through pine, spruce and cedar forest." Of course the forest he describes is no longer there and your route is mostly exposed with lots of dead trees.